A 65-year-old woman, center, is rescued by divers from the Dongfangzhixing or "Eastern Star" vessel, which sank in the Yangtze river in Jianli, central China's Hubei province, June 2, 2015. Rescue crews in central China continued Tuesday searching for survivors after a passenger ship carrying 450 people sank in the Yangtze River during a storm. The Xinhua news agency said only 15 people have been rescued from the Dongfangzhixing or Eastern Star. Rescue workers are battling swift currents and bad weather, including heavy winds and rains, which is impacting work above and below water. 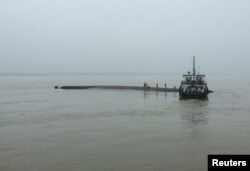 Three of the five bodies recovered so far were found downriver in Yueyang in Hunan province, about 50 kilometers from the location of the shipwreck, according to the People's Daily. Many of the passengers, most of whom were elderly Chinese tourists, are believed to be trapped inside the Eastern Star. Rescue workers search on a sunken ship in the Jianli section of Yangtze River, Hubei province, China, June 2, 2015. CCTV showed images of rescue workers tapping on the hull of the ship as it bobbed above the surface. The broadcaster reported workers have been hearing tapping sounds in response to their efforts to locate those who might still be alive and trapped inside. Shortly after noon Tuesday, a 65-year-old elderly woman was pulled from the wreckage and was seen being helped out of the water by rescue workers. State media said the rescued woman is in condition is stable. Another person was pulled out later and state media said divers have located another five passengers beneath the wreckage, saying efforts are underway to get them to safety. Over 1,000 troops and 48 vessels are involved in the rescue operation, according to the People's Daily. The cause of the accident is not clear. ​The ship’s captain and engineer were among the first to escape the tragedy. Both are being held in police custody as authorities try to understand what happened to the ship. China’s state media blamed the incident on bad weather the Eastern Star encountered while traveling from Nanjing to Chongqing. The Xinhua news agency reported that both the captain and chief engineer said the ship was suddenly struck by a tornado and quicly capsized. The Eastern Star has been in service for more than 20 years and is owned by the Chongqing Oriental Ferry Company, a state-owned enterprise that is struggling with mounting debt, Chinese media reports said. China's state broadcaster, CCTV, said the company runs tours in the region of the Three Gorges dam. It said the vessel was capable of holding up to 534 people. Family members of passengers on the ship which sank at the Jianli section of Yangtze River, in Hubei province, cry outside a closed office of Xiehe Travel in Shanghai, China, June 2, 2015. Chinese authorities were quick to take action, putting their emphasis on efforts to save possible survivors. Premier Li Keqiang is personally overseeing rescue efforts, and arrived early Tuesday at the rescue site with a work team from the State Council, China's chief administrative body, according to Xinhua. President Xi Jinping has demanded an "all-out" effort to rescue the passengers, most of whom are believed to be between 50 and 80 years old, according to state media. China’s state-backed media has focused most of its reporting on what officials are doing and how a range of government resources are being dedicated to help save lives. As with most safety incidents in China, the government is likely to maintain a tight grip on the accident’s narrative to minimize any criticism that could be directed toward authorities. Early Tuesday, there were already reports that Chinese journalists were being blocked from traveling to the site of the accident. Journalists in China are also being told to only use images from Xinhua and CCTV. Elsewhere, relatives of the missing waited anxiously to hear news about their loved ones and demanded answers on the seemingly slow pace of the rescue effort. "This morning, we saw online that a boat had flipped over. It happened at 11 p.m. last night. We tried to contact our families first. We called all of them, but nobody answered," said Chen Guifu, who has five family members on the ship. Also, distraught relatives of some of the passengers scuffled with officials in the city of Shanghai, where many of those on board booked their trips, angry about what they said was a lack of information about their loved ones, Reuters reported. The disaster could bring a bigger toll than the sinking of a ferry in South Korea in April 2014 that killed 304 people, most of them children on a school trip. Some information for this report came from Reuters and AP.